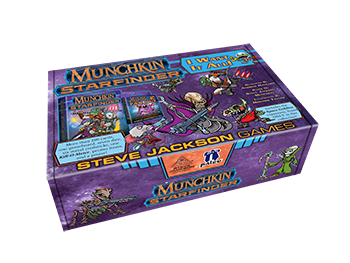 Daily Illuminator: Munchkin Starfinder Preorders Closing Soon! December 15, 2017: Munchkin Starfinder Preorders Closing Soon! Did you miss out on the recent Munchkin Starfinder project on Kickstarter? Do you still want to get your hands on that big "I Want It All" Munchkin Starfinder box that's loaded with everything unlocked during the Kickstarter project . . . at the Kickstarter price? Here's your last chance! We're closing Munchkin Starfinder preorders (now on BackerKit) very soon so we can send the project to the factory . . . we need those final numbers to produce enough for everyone who backed the project and placed preorders. Only three of the Kickstarter items will go to distribution sales for a wider release: Munchkin Starfinder, Munchkin Starfinder 2 – Far Out, and the Munchkin Starfinder "I Want It All" box . . . and that won't be until late in 2018. Also, the I Want It All box will be listed at a retail price of $99.95, which is a bargain but not quite as good as what you'll enjoy if you grab the preorder now. Why not send all of the accessories – dice, metal credsticks, and more – into distribution sales? As you may know, today's game market is increasingly cluttered, with more new stuff each week than ever before. We're limiting our inventory risk by keeping most of the Munchkin Starfinder expansion items out of our distribution catalog. If we end up with leftovers, some may find their way to Warehouse 23, but our goal is to have near-zero of each of the accessories after we deliver Kickstarter rewards and fulfill preorders. So if you want extras of the various accessory items – which will not be packaged for retail sales – preorder them now. Will we ever reprint Munchkin Starfinder and some (or all - or any) of the game accessories unlocked during the Kickstarter project? Possibly, but no promises. We're focusing on keeping the core Munchkin items available and creating a rotating slate of new Munchkin games; the days of working as hard as we can to keep the entire Munchkin line in stock are behind us.